Florida’s Democratic gubernatorial candidate says claims of electoral fraud without evidence by President Donald Trump and Florida Gov. Rick Scott were sowing seeds that could undermine confidence in the democratic process. Tallahassee Mayor Andrew Gillum told a packed church of 200 supporters in Orlando Tuesday night that he would fight “with every fiber in my body” to make sure that every vote is counted as Florida’s 67 counties work to complete a machine recount and face the prospect of a manual recount. The machine recount was triggered in Gillum’s gubernatorial race against his GOP opponent, Ron DeSantis, as well as in the U.S. Senate race between Scott and incumbent Democrat Bill Nelson. Gillum says claims by Trump and Scott about electoral fraud in counties that were taking time counting ballots were equivalent to trying to disenfranchise voters. U.S. Sen. Bill Nelson and a Democratic campaign committee are continuing to file lawsuits over the recount now underway in Florida. A Florida circuit judge is suspending looming recount deadlines, but her ruling applies to Palm Beach County only and does not apply to the U.S. Senate race between Bill Nelson and Rick Scott. Leon County Judge Karen Gievers ruled Tuesday that a machine recount in two other statewide elections, including the race for governor, can go beyond Thursday’s deadline. Gievers also extended the deadline for a legislative race. Jim Bonfiglio, a Democrat running for the Legislature, filed the lawsuit asking that recount deadlines be suspended. Gievers agreed to the delay because Palm Beach does not have enough machines to do four recounts at the same time. It’s not clear, however, if Gievers’ ruling will remain in place. Lawyers for Secretary of State Ken Detzner have asked that the lawsuit be moved to federal court. U.S. Sen. Bill Nelson and a Democratic campaign committee are filing another lawsuit related to the ongoing recount of the U.S. Senate race in Florida. Lawyers for the Democratic Senatorial Campaign Committee and Nelson filed a lawsuit in federal court Tuesday. This lawsuit asks a federal judge to push back the deadline for a potential hand recount in the race. It also asks a judge to set aside some of the rules in place for a hand recount. Right now counties are doing a machine recount of the tight race between Nelson and Florida Gov. Rick Scott. If Nelson and Scott are separated by 0.25 percent or less after the first recount then a second hand recount will be ordered. The results are due Sunday. Schumer and U.S. Sen. Bill Nelson, both Democrats, spoke with reporters Tuesday in Washington. Scott, a Republican, is challenging Nelson for his Senate seat. Scott’s slight lead over Nelson following last week’s election prompted an automatic recount. Schumer says Scott should recuse himself from any duties connected to the recount. Nelson echoed those sentiments, saying Scott can’t oversee the process in a fair and impartial way. Schumer says election officials should have all the time they need to count every vote, rather than Sunday’s deadline. He says President Trump, who has made unsubstantiated claims of voter fraud, should stop bullying, harassing and lying about the vote in Florida. Broward County Supervisor of Elections Brenda Snipes told reporters Tuesday that “it is time to move on” and that she believed she had fulfilled her duties. When asked directly if that meant she wasn’t running for another four-year term in 2020, Snipes said no final decision had been made and she would check with her family. President Donald Trump is going after Democratic Sen. Bill Nelson for not conceding in his contest against Republican Rick Scott. Former Florida U.S. Rep. Patrick Murphy says his ballot didn’t count because of a discrepancy with his signature. Murphy, who was the Democratic nominee for the U.S. Senate in 2016, said he hoped to appeal, but learned the Nov. 5 deadline had already passed. He said the burden should be on election supervisors to proactively notify citizens. He said these “kinds of error and mishaps” are troubling in a state like Florida with a history of close elections. The White House is again weighing in on the Florida Senate recount. Republican Gov. Rick Scott holds a narrow lead over incumbent Democrat Bill Nelson. She said the president is confident Scott will win. 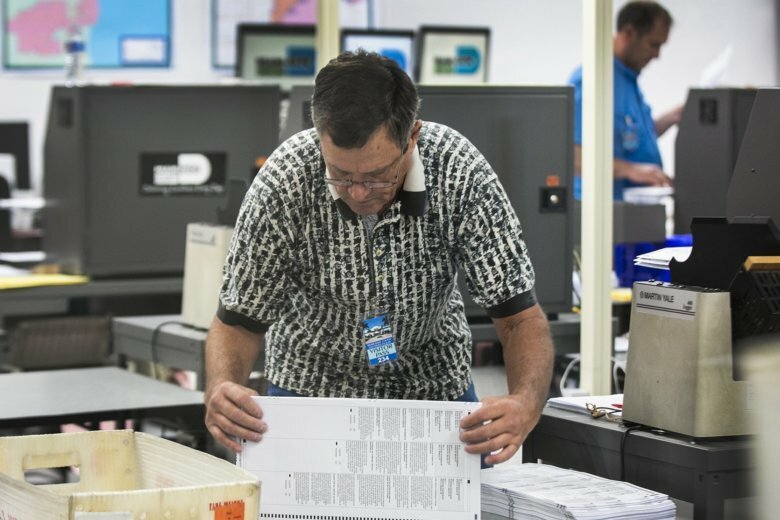 Florida’s election recount of its Senate and governor’s races is chugging along as more irregularities are uncovered. Bay County revealed Monday that it had allowed some hurricane-displaced voters to cast their ballots by email — a violation of state law. Manatee County had to restart its recount after getting about a quarter finished because someone forgot to push a button. And in oft-criticized Broward County, additional sheriff’s deputies were sent to guard ballots and voting machines. A judge said no Republican who has publicly alleged fraud in Broward’s process has filed a criminal complaint. That list includes President Donald Trump and Gov. Rick Scott. Scott’s Senate contest against Democratic incumbent Bill Nelson is one race being recounted. Republican Ron DeSantis is leading Andrew Gillum in the governor race.